English: A bouncing ball captured with a stroboscopic flash at 25 images per second. 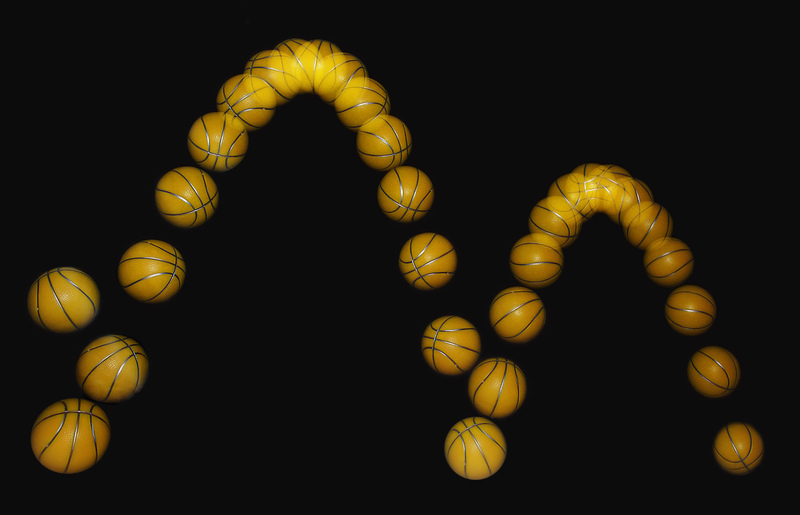 Note that the ball becomes significantly non-spherical after each bounce, especially after the first. That, along with spin and air-resistance, causes the curve swept out to deviate slightly from the expected perfect parabola. Spin also causes the angle of first bounce to be shallower than expected. As a ball falls freely under the influence of gravity, it accelerates downward, its initial potential energy converting into kinetic energy. On impact with a hard surface the ball deforms, converting the kinetic energy into elastic potential energy. As the ball springs back, the energy converts back firstly to kinetic energy and then as the ball re-gains height into potential energy. Energy losses due to inelastic deformation and air resistance cause each successive bounce to be lower than the last. The image is of a child’s ball about the size of a tennis ball.